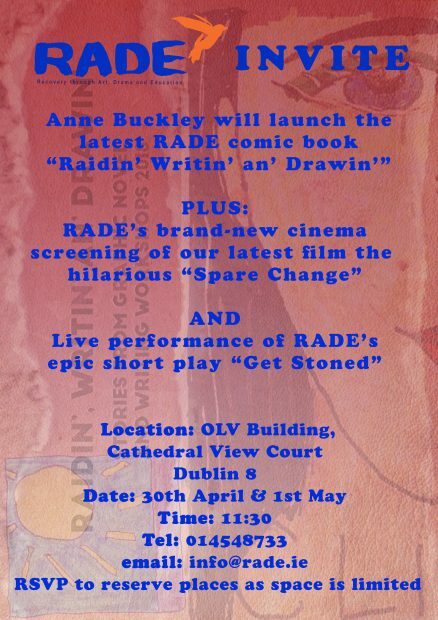 The launch of our new book of art and poetry entitled ‘Raidin’ Writing & Drawing’. The launch will take place at our premises, The OLV Building, Cathedral View Court, New Street, Dublin 8, at 11:30am on both Tuesday 30th April and Wednesday 1st May. Anne Buckley will formally launch the book on the 30th of April. We will be screening our most recent film ‘Spare Change’, and performing a RADE signature drama piece ‘Get Stoned’, on both dates.